Did you know that in the United States and Canada, we grow many more trees than we harvest each year? That’s just one of several interesting facts that can help dispel some paper industry myths about our environmental impact. 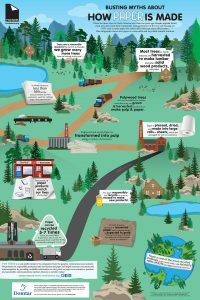 And now, you can learn the truth about the papermaking process in this infographic from Two Sides North America, a nonprofit initiative comprised of companies from the graphic communications industry whose goal is to dispel common environmental misconceptions. In North America, less than 36 percent of the annual timber harvest is directly used for making paper and paperboard. Pulpwood trees, which are unsuitable for lumber manufacturing, are sustainably grown and harvested specifically to make pulp and paper. And paper is one of the most recycled products in the world, with recovery rates of 65 percent and higher in North America. These and other interesting facts help bust paper industry myths by shedding light on how the North American paper industry operates in a sustainable, environmentally friendly way. Take a closer look at this infographic, which can be downloaded, printed and shared. You can also learn more about the paper industry through videos, fact sheets, reports, research, blog posts, case studies, Q&As and other materials, all of which are available on the Two Sides North America website.